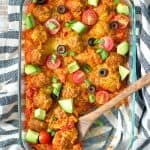 A delicious, cozy and comforting taco casserole made with only 10 minutes prep and simple ingredients. It couldn't be easier to get dinner on the table! 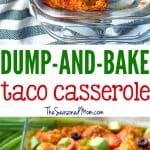 Dump-and-Bake Taco Casserole is a healthy, easy dinner with only 10 minutes of prep! 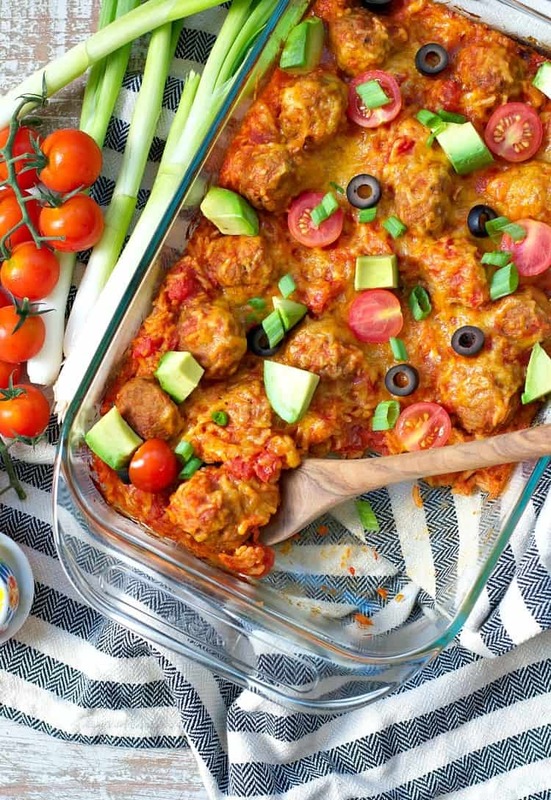 Salsa rice and cheesy turkey meatballs cook together in just one dish! 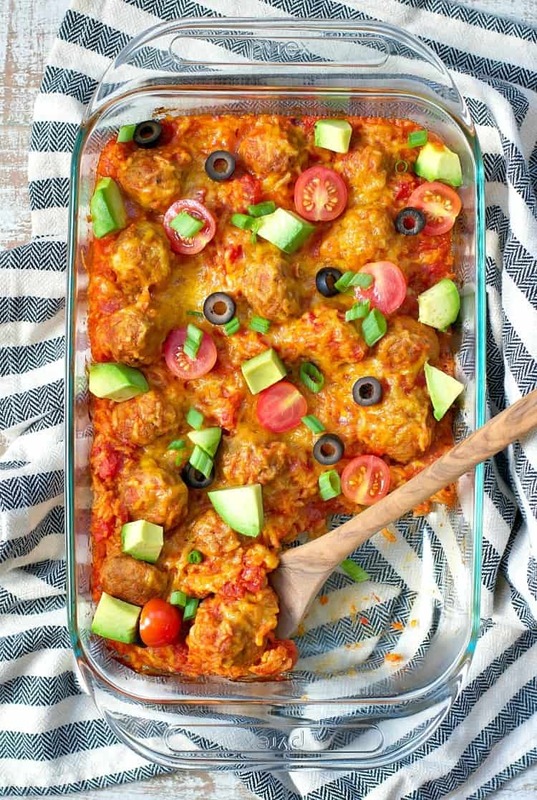 This taco casserole is super quick and comforting just what we need on busy weeknights. 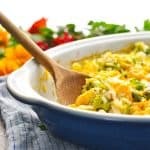 Best of all you can actually prep this casserole ahead of time, leave it in the fridge and bring it out when you’re ready to eat! 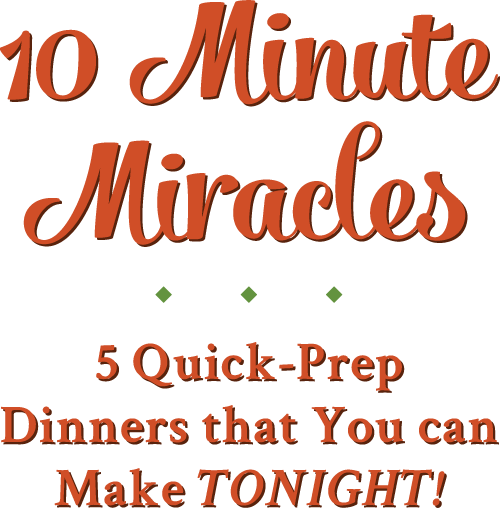 I love dishes that can be prepped in advance or have very little prep altogether, that way when hunger strikes I’m only a few moments away from a cozy, comforting and delicious meal that I know the whole family will love. What’s In This Taco Casserole? 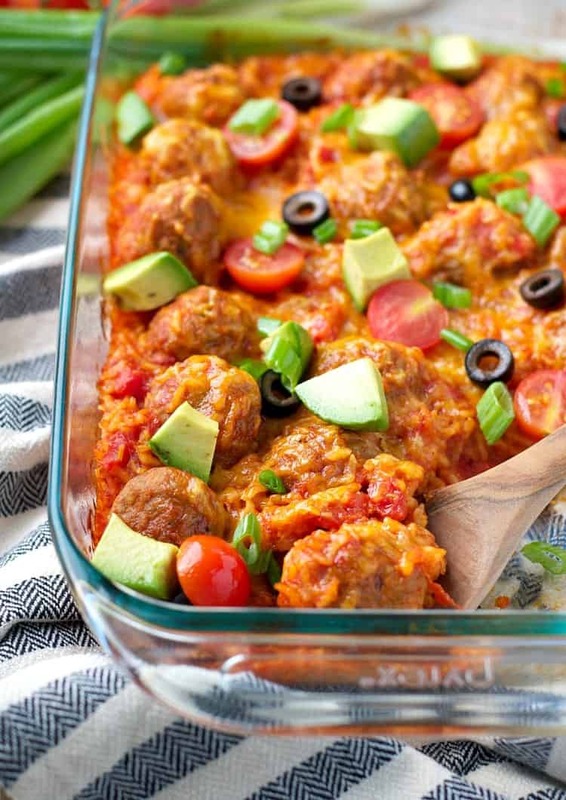 Juicy turkey meatballs, rice, tangy cheddar cheese, taco seasoning, and sauce make up this delicious casserole. The ingredients are simple and it’s all made in one dish, that’s what makes this so easy. I just love the combo of meatballs and rice together with the freshness of the tomato sauce and tangy cheddar. You can also top the casserole with your favorite toppings for the ultimate comfort food meal! 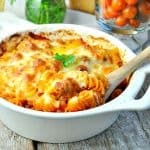 For a lighter version of this casserole try going for a reduced fat and low sodium cheddar or cut the cheese by half. You can also look out for lean turkey meatballs although turkey meat is already pretty lean. Cooking for Just Two? You can cut the ingredients in half and bake the casserole in an 8-inch square baking dish. Keep an eye on the dish as it bakes, though — it might require slightly less time (closer to 45 minutes instead of an hour). Want to Prep Ahead? 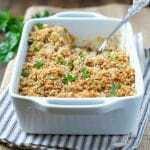 You can prepare the entire casserole ahead of time (through Step 3), and then keep it in the refrigerator until you’re ready to bake it. Preheat oven to 375F (190C). Spray a 13 x 9-inch baking dish with cooking spray. Stir taco sauce, water, tomatoes, taco seasoning and rice together in prepared dish. Add meatballs and ½ cup cheese; stir to combine. Cover the baking dish tightly with foil (make sure it’s very tightly sealed so that the moisture doesn’t escape – the rice needs the liquid to cook). Bake for 45-60 minutes, or until the rice is tender. During the final 5 minutes of cooking, remove dish from oven, uncover, and sprinkle with remaining ½ cup of cheese. Place back in the oven (uncovered) for the final 5 minutes, or until cheese is melted. I can’t relate to the kids part, but I often run on little sleep and need easy dinners. This taco casserole looks perfect for me, Blair! You make the BEST dump and bake ones. Can’t wait to try this out! Easy dinners are always a welcome option, right? Thanks, Gayle! Oh my goodness, I hope you were able to catch up on your sleep last night, Blair. Sounds like the kids will be ready for a full night’s sleep too. I know what it’s like to be dead on your feet all day and wonder how you’re going to make it to bedtime. This dinner is the perfect answer! Now you have to find a way to convince them to sleep in on the weekends, lol. 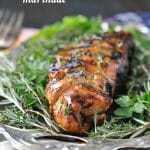 This looks delicious and SO easy!! Adding this for next week. Thanks Blair!! Hi, Kimber! Thanks so much for stopping by. I hope that you love it! 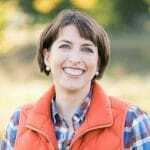 I hope your boys all enjoy lovely sleep ins this weekend and let mama catch up on some Zzzz’s! This sounds great!! Going to make it for dinner tomorrow! Thanks for the recipe!! Thanks, Kelly Lynn! I hope that you love it! QUEEN OF DUMP AND BAKE MEALS! Seriously!! HA my kids are away before 6am almost every day. Like WHAT?! NO. IT’S STILL DARK! Someone give them the memo, not cool. I feel ya! Made it tonight. Didn’t have any meatballs and used little smokies, delicious! Great recipe. Thanks for letting me know, Elke! The lil smokies are a GREAT idea! I need to remember that! Sounds great! But when you say “taco sauce”, are you talking about salsa or enchilada sauce? I’ve only seen taco sauce in a very small bottle. Hi, Dianne! There’s actually a sauce called “taco sauce” that you can find right next to the salsa at the grocery store. It’s sold in the same size bottles as you would find salsa (big) and it’s basically just salsa that’s been pureed until it’s completely smooth. My kids don’t like the chunks in regular salsa, and the taco sauce is so mild that I go with that to keep it kid friendly. I buy the Old El Paso brand, but there are other companies that make it as well. Think of it as “smooth salsa.” 🙂 Kind of like the difference between smooth peanut butter and chunky peanut butter. I have some brown rice that is the “fifteen minute cook” type rice, not instant, not long grain white. I have used in in stuff peppers where it was still a little stiff so I”m wondering…cook it a bit before sticking it in here? Hi, Kiley! Since this recipe calls for long-grain white rice (uncooked), I think that your 15-minute brown rice would probably work fine. Typically, brown rice requires a longer cooking time than white. However, since this 15-minute brown rice is parboiled for shorter cooking, it’s probably pretty similar to the uncooked white rice. That said, I haven’t tried that rice in this casserole, so I can’t be sure exactly how long it would take to cook. Also, you’ll want to account for the liquid. As the recipe is written, it assumes that the uncooked white rice will absorb a large amount of the liquid during the cooking time in the oven. If you’re using the quick-cooking brown rice, it probably won’t require quite as much liquid in the dish. You might cut that back to about 1 1/2 or 1 3/4 cups of taco sauce. Hope that helps, and let me know how it works out! Hi, Becky! I haven’t tested it with the cauliflower rice. I think it might work, but you’ll have to make some adjustments to the liquids because the cauliflower rice will not absorb the cooking liquid like the regular rice does. The final texture will still be different (since there isn’t any rice to release starches and thicken the sauce), but the cauliflower rice option would probably taste good. You’d want to omit the water entirely, drain the diced tomatoes, and cut back the taco sauce to just a small amount. Hope that helps, and enjoy!